If you’re looking into getting solar for your home, business, or RV then you might be overwhelmed with the sheer amount of panels available. There are simply so many different types solar panels on the market and knowing the best one is essential to a successful solar experience. Since our website is dedicated to everything solar then we had to write an article on the different types of solar panels available. The list down below doesn’t contain all solar panels, but includes the most common panels on the market. Be sure to read about each panel. Doing so will give you the most information so that you can make an educated buying decision. Monocrystalline silicon solar panels are one of the most powerful and efficient solar panels available. These premium panels have a high energy efficiency that is due to their high quality silicon. These high-efficiency rates range through 15 to 25%. As a result of their high energy conversion rates, you need fewer panels to obtain a large amount of power. This makes monocrystalline silicon solar panels ideal for roofs since most people have limited space. 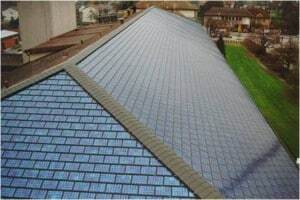 Since these panels are premium they are much more expensive than other panels on the market. You just have to keep in mind that you need fewer panels though since they are more productive. So in general the price somewhat evens out. If you ever look at monocrystalline panels you will notice that they are made with even colored uniformed solar cells. Every cell on these panels look exactly the same and have the same color. Monocrystalline cells also have their sides cut off to optimize performance and to lower the costs of the cells. In combination these characteristics are what differentiate Monocrystalline from other solar panels. Polycrystalline silicon solar panels are lower grade panels that offer a cheaper option than monocrystalline panels. These panels utilize less silicon which makes them slightly less expensive. At the same time this also makes them less efficient. Most polycrystalline solar panels have an energy conversion rate of around 13 to 16%. This lower conversion rate makes it so you must buy more panels then monocrystalline. For people who have very small areas to work with then this might be an issue. With that being said polycrystalline panels are still very effective at powering ones house. Efficient design and construction allow them to fit on most rooftops. So you shouldn’t have to worry about space too much with these panels. Polycrystalline have their own particular cosmetic look. They are cut into perfectly square wafers and don’t have the cut edges like monocrystalline. Polycrystalline also look different as they do not have a uniform color. Instead they have multiple blue colors that look similar to scales on a fish. 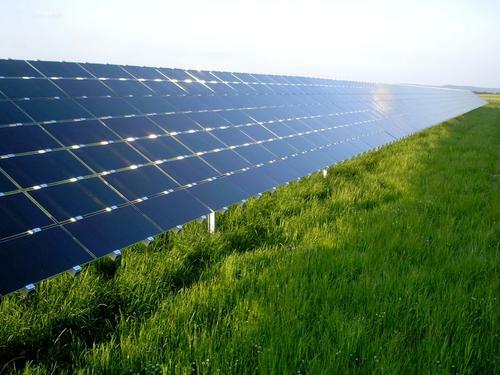 Thin-Film solar panels are the most production friendly solar panels. Reason for is because they require fewer resources and are relatively simple to make. Since this is so they are less expensive and are perfect for solar fields. 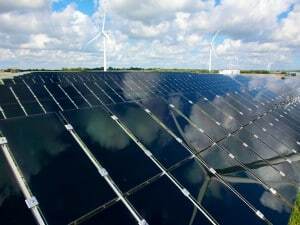 Thin-Film solar panels do have low energy conversion rates. These rates usually range from 7 to 13%. Because of this low conversion rate they are not well suited for residential use. You simply need so many panels that they wouldn’t fit on the roof. One great thing about Thin-Film solar panels is that they are flexible and have a durable design. For this reason some portable solar chargers have been made with these panels. Building Integrated Photovoltaics, while technically not a specific type of solar cell, are a great option for those who want a less intrusive solar experience. What makes them different from other panels is that they are integrated into your home instead of just on top (Like the photo to the left). This integration allows BIPVs to be less intrusive and a much more passive solar experience. Some good examples of BIPVs include solar shingles, windows, walls, and etc. BIPVs are usually made from crystalline-based and thin-film solar cells. Companies then put these cells into outdoor household item so they seamlessly blend in. Since BIPVs are made with these cells they typically have a lower energy conversion rate. Along with being less efficient they are also very expensive. For this reason they are not a viable option for many households. 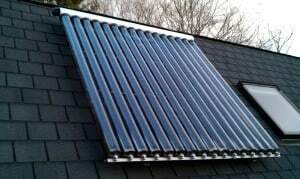 Solar thermal panels are solar panels that don’t convert electricity. Instead they use the sun to produce hot water for your home or pool. So instead paying the gas company to heat your hot water tank you have these devices. Unfortunately solar thermal panels are slowly becoming a technology of the past. Using actual solar panels has become a more efficient way of heating water. With that being said solar thermal panels are a great option for some. Especially if you have a large pool that you need to heat. In conclusion we hope this article helped explained the different type of solar panels available. It should be known that there are much more different type of panels that we didn’t mention in this article. This is because there is simply so many that it would take forever to explain all of them. Instead we simply talked about the most common solar panels out there. Be sure to check out the links down below and contact us if you have any questions. We love hearing feedback and would like to get your opinion.